WASHINGTON, D.C. -- U.S. Sen. Bill Nelson called on Congress Wednesday to enact a federal ban on pet pythons. Nelson made the remarks in the wake of a Burmese python strangling a 2-year-old girl in Sumter County last week. The tragedy was the latest and most graphic example of a problem that has plagued the state for more than a decade: a nonnative species that is wreaking havoc in the Everglades, threatening the environment, native wildlife and people. "It's just a matter of time before one of these snakes gets to a visitor in the Florida Everglades," Nelson said. Nelson has introduced a bill to ban imports of the snakes, after years of trying to persuade federal wildlife officials to restrict their entry into the country. The legislation would target pet owners who abandon snakes in places like the Everglades, where the snakes now are an invasive species threatening wildlife. One federal biologist estimates there are at least 100,000 pythons in the Everglades. Nelson�s bill must face a vote before the full Environment Committee. Nelson was one of several senators who warned about the threat of invasive species at a hearing Wednesday. From a mysterious fungus attacking bats in the Northeast to zebra mussels in the Great Lakes and snakehead fish in the Chesapeake Bay watershed, native wildlife is facing new threats nationwide. Lawmakers are considering a variety of measures to address the problem, including a bill that would require cargo ships to discharge ballast water to ensure that invasive species do not attach themselves to their hulls. Most invasive species enter the country through oceangoing vessels. Sen. Carl Levin, D-Mich., said he supports a strong national standard for ballast water treatment that would remain in place for several years, giving ship owners time to develop new technology. Levin also supports a ban on imports of Asian carp, but said the aquatic species plaguing Michigan are no match -- in size anyway -- for the Burmese python, which can grow to 18 feet and has been known to eat alligators and even deer. Burmese pythons are native to southeast Asia, but they survive easily in Florida's warm, moist climate. Some owners have freed the fast-growing pythons into the wild and a population of them has taken hold in the Everglades. Scientists also speculate that a bevy of Burmese pythons escaped in 1992 from pet shops battered by Hurricane Andrew and have been reproducing ever since. Lawmakers also discussed the fungus killing Northeastern bats. Since it was discovered in a cave in upstate New York in 2007, the so-called white-nose syndrome has spread to 65 caves in nine states, and killed at least 500,000 bats. The disease now spreads from Virginia to Vermont and could expand across the county, officials said. This is long over due. Too many people are careless and do not think things through. They get these snakes and other animals, on a lark, out of temporary interest, and do no research as to how big they get...or if they do they don't seem to care at the time. Then they think, well it's Florida, toss it out, warm enough it will survive. Again not thinking how this will affect the local species that are native there, and also to the humans. It's about time. These animals belong in the wild and not someones home. Thanks Raffi. And what about the population of Burmese pythons in the wild? I fear that they are in a decline in their native habitat. We do not need exotic pets at all. Most of them are dangerous, AND the focus on the captive ones is taking time and money away from the wild populations, most of which are in severe decline. I was reading about European starlings some time ago...they have been thriving in the US, where they were introduced in the 1800s. They are another invasive species, as they bully native birds away from their nests and take them over. Unfortunately, it appears that the European starling is declining in England, where it IS native. lONG OVER DUE, PEOPLE GET THESE POOR ANIMALS THEY GET TOO BIG, THEY TURN THEM LOOSE TO FEND FOR THEMSELVES~! you know it allway's seem's to take a tragety before these useless politition's pull there finger out of there...only now because they have some heat on them to do something,my god a 2 year old little girl that is so,so sad and to think it didnot have to happen,and i here of tragic thing's like this all the time involving exotic animal's,that have no place in the average person's possetion.how about it politition's start passing some law's in this matter and to meny to mention more stop with the bonus that you give to each other and start doing your job's.this realy pisses me. I heard about a pet python many years ago strangling and killing a pregnant women who was asleep in bed. These snakes when grown are very very strong! I would not keep one after hearing that. They belong in the wild where they are needed to keep rodent population under control. This is such a no-brainer! Why does anybody want to keep a snake in captivity anyway? They don't belong there. This is just horrible and I am glad someone is doing something to stop people from keeping them. They actually buy pet rats and mice in pet stores for them ad other pets that they often get in free ads. well jan, for the same reason they want these big fancy birds that are being ripped out of the jungles or rabbits that belong in the woods (hint hint) or rats, lizards, fish any damn thing thats hip at the time. 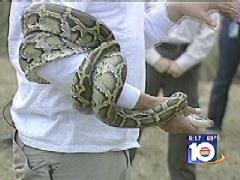 miami has a ban on owning pitbulls but they say nothing about the snakes that are being brought in by the thousands. its about time they do something. just ashame a baby had to die though thats what piss's me off the most about it that poor baby and how she must have suffered.